Special Equipment: Overhead projector with computer to show powerpoint slide show (on thumb drive) if presentations are 45-60 minutes or longer. Who doesn’t love cute animals? And real photographs of cute, familiar, animals like squirrels doing human-like things like barbequing, doing laundry, camping, celebrating Christmas, etc. are something that young and old just seem to love. Since I am both illustrator (photographer) and author of my books, I liven up my workshops and school readings by bringing along a big plastic tote box filled with some of the homemade props which I have used in my stories and talking about how I made them and the little dioramas for my photoshoots. My presentation outlines my journey from photographer of wild squirrels to crafter/photographer and then “accidental author”. I tailor the presentation to suit the age and attention span of the groups I meet with, going more into the roles of the various people and skills involved in getting a book published (author, illustrator, editor, agent, designer, publisher…) with older students. In talking about how I became an author/illustrator, I ask how many enjoy making crafts, and writing, and usually see a big show of hands. I tell them how I grew up with 6 siblings and we were always busy making stuff. I loved making clothes for my dolls and building and making furniture for my doll houses. I am now doing just what I loved doing when I was their age and I never expected to become an author, so following your passions can sometimes lead you to very unexpected places. I discuss how I was first just taking photos of squirrels sitting on my deck rail, and then I started adding things and creating story scenes to make it more interesting. I talk about the process of making my own props and dioramas for the squirrels and show them examples and photos. Many of my props are made using recycled and dollar store materials so I stress the importance of using one’s imagination to find new uses for common objects. For older grades, I talk about the whole process of creating a book. We talk about the roles of author, illustrator (and the various ways books can be illustrated), editor and publisher. To illustrate the importance of being flexible and open to changes and new ideas, I tell them about how I was contacted by a literary agent (and her role) who saw my photos and asked me to submit a book idea to her. My sister is a children’s author also, so I turned to her for advice. For my first story I went through all my photos and came up with an idea which I sent to my agent. It was an alphabet book, and I show them samples of the photos I had developed for it. Just when they think it looks like a great idea, I tell them that when my agent presented it to the publishers, they wanted a “story” and not an alphabet book, (kids groan) so I then worked closely with their editors to come up with the storyline for the first book using many of the photos I had already taken over the past couple of years and creating some new ones. With older students I talk more about the role of the editor and how your teacher is often your editor, but so are your peers. Their feedback makes you a better writer. When the publishers saw that the first book was popular they asked for a second one. For the second book, they suggested a Valentines story so I started working on that. Then they changed it to a Christmas story so I started some new ideas. After the second book came out, the publishers talked about possibly doing a third book with the theme of autumn or Halloween, so I made lots of props and photographed some scenarios for that, just in case. Then they decided it would be a Valentines theme, so I worked on that again. The kids usually laugh at all the changes. For the newest book the publisher suggested the back-to-school theme. I tell them I had about five different little stories with that theme, which I shared with some teacher friends for feedback. I tell them about researching your ideas, and how I talked to many elementary teachers about children’s biggest worries on the first day of school, so I used that information for my story. Patience and planning are big themes in my work. Children always want to know HOW I got the shots and how I got the squirrel to pose for me. I talk about how I hide peanuts in just the right places so the squirrel will go to look in the spot where I want him to stand, and I take LOTS of photos to be sure I get one in focus with the squirrel doing something that tells a story. Sometimes it might even take a few days to get the photo I have in my mind, and sometimes I may have to change the words in the story to match the photo better. To illustrate again how you need to be flexible working with editors, I show them the paper mâché school bus I made for the latest book and talk about the challenges of getting a shot of the squirrel climbing the steps and going through the bus doors, (it took days to get a shot I liked!) and then my publisher wanted something funnier…like the squirrels sitting on the hood of the bus….which I had LOTS of, and almost discarded… The kids get a great chuckle. At some point I ask the students if my books are fiction or non-fiction and this always sparks a good discussion, with arguments being made for both answers. At the end of my presentation the students come up to the display table and walk around inspecting the props (without touching). They always have so many “how did you make that” questions. The older students seem the most keen because they are at the age where they are also making things and they start to get some ideas. Many of them tell me they are going to go home and make something for their pet (I have heard all about lizards and hamsters and guinea pigs…) and they may try to see if they can get photos of them with some props. I have had parents share photos or stories with me on my Facebook page after my presentations, and a Girl Guide troop who made an entire camping scene with a tent, campfire etc. for me to use). Being able to pass on the joy of creating and spending time with nature has been a true blessing! For smaller groups I like to sit on a stool or chair with students sitting on the floor in front of me, but I am just as comfortable with a microphone and slide show in the background for larger groups. Note: The props I bring may have had nuts hidden in them, so I have cleaned them all to remove traces of nuts and sealed each prop in its own plastic bag to minimise the chances of students contacting nuts. I always ask the students to look but not touch. In the event that a school has student(s) with very serious nut allergies, I have a slide show I can use as a visual backup to my presentation instead of bringing the props. Nancy Rose lives near Halifax, Nova Scotia, with a busy backyard filled with squirrels, birds and several deer who wander through every day or so. After a career as a Guidance Counsellor and Family Studies teacher in Newfoundland and Nova Scotia, she retired in 2016 and helps looks after her 2 little grandsons two days a week. Nancy comes from a family of seven children where creativity was always encouraged and over the years she has pursued a variety of art and craft endeavors. Her interest in nature and wildlife, and a storage room full of fabrics, paint, clay and craft materials merged with her photography passion when she discovered the curiousity of the little North American Red Squirrels who raided the bird feeders in her backyard. 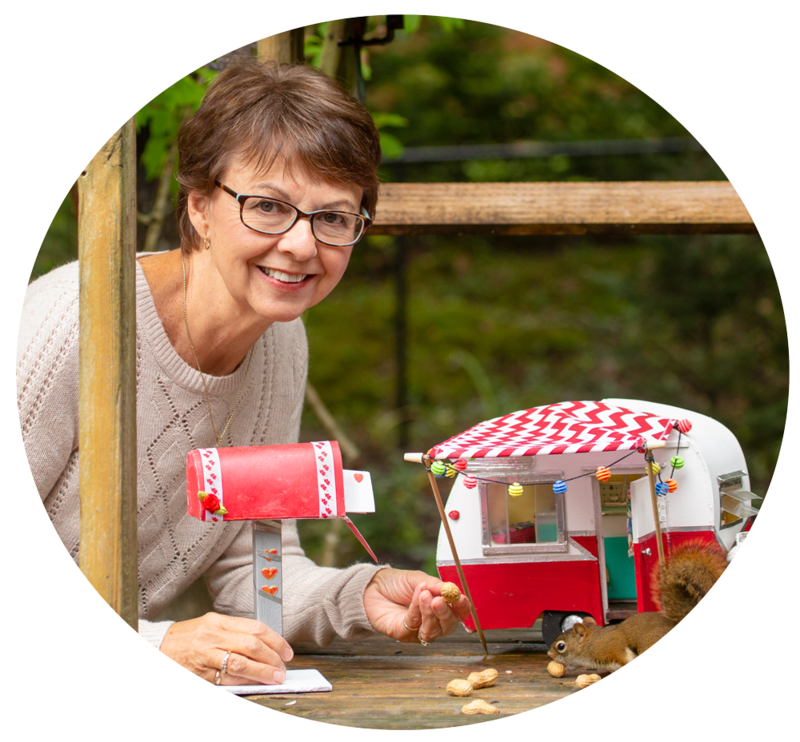 By making miniature settings and squirrel size props she has created hundreds of scenarios where the inquisitive squirrels find themselves in some rather human like poses as they search for peanuts hidden in the props. Her best “actor”, Mr. Peanuts, was the first to eat from her hand and he has been followed by a succession of cute and curious squirrels who come daily for peanuts and sunflower seeds and to check out whatever Nancy puts out on the picnic table on her deck. In 2013 Nancy’s squirrel photos were “discovered” on her flickr page and have since been featured in numerous newspapers, magazines, and on websites, including Amusing Planet, Buzzfeed, Petapixel, Kelby TV, the Daily Mail in the UK. She has had interviews with a German TV show, the Washington Post’s “Third Annual Squirrel Week” series, and her local media The Halifax Herald, CBC, Global TV, and CTV news also discovered her work and did some interviews at her home. When some of her amusing squirrel photos appeared in The Toronto Star and National Post in 2013, she was contacted by a literary agent at Westwood Creative Artists. From there the books were born. Nancy’s first book, The Secret Life of Squirrels, was published simultaneously in Canada and the US in 2014 (notice the color of the mailbox on the cover) and has also been published in Japan and South Korea. It is also available in a board book for the youngest readers. Merry Christmas, Squirrels followed in 2015, and The Secret Life of Squirrels: A Love Story in December 2016. The Secret Life of Squirrels: Back to School (July 17, 2018) continues the adventures of Mr. Peanuts and Rosie, his special friend. The first three books are also available in paperback through Scholastic Books.